Steve Baker and his wife Julie and Theresa Greenwood appeared on the radio station WSMI today. 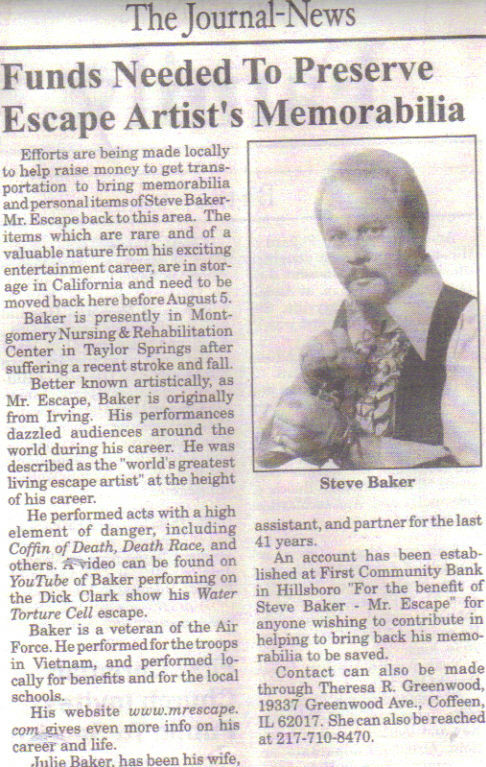 Mr.Escape talks a little about his career and about the effort to raise money to bring back his memorabilia that remains in a storage unit in California. You can listen to the podcast below. If you follow this blog, you know Steve Baker has been having some difficult health issues this year. One of the consequences of these problems is having to go through months of rehabilitation in a Nursing/Rehab Center. He is also apart from Julie his wife of 41 years. They do speak daily and she does see Steve often, but it's a strain on everyone involved. Another consequence of his health issues is the fact that his storage unit in California could go into default soon. If that were to happen, he could loose the remainder of his many career mementos, along with a great deal of personal items that are in storage and some escape equipment. Steve has had a rough run over the past few months. He was out of the Rehab Ctr in early June only to be taken back after a bad fall. He is still there and working hard to recover. Nurses and Doctors are amazed at his progress, but he still has a long way to go.